In early 2001, new corporate owners switched MAD to full-color and included third-party ads. I immediately canceled my subscription and never really read the magazine again. I'm not that impressed with the bits of it I've read here and there since, but some is still good. I also appreciate the satire of stuff like The Onion. 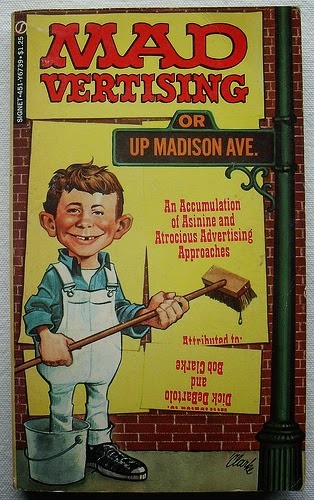 But nothing today is like the MAD magazine pre-advertising. Adbusters does a good job attacking advertising and consumerism, but it's more bluntly political and serious. It took me a long time to realize what life is like for most people who have had much less blatant awareness of the manipulative machinations of advertising. Ads have now infiltrated our lives deeper than ever with all our online activities being tracked in order to specifically target each of us most effectively. Today's virtual news-stands are themselves deeply intertwined with the ad-biz and have no interest in promoting ad-free satire if there's any great stuff out there still (it's hard to know what's truly ad-free myself since I block ads online anyway, but feel free to tell me about your favorites I may have missed). We break this blog post to bring you this special Public Service Announcement: If you are not already running an Ad-blocking plugin, go install one immediately. DO IT. They even block video ads! My recommendation: uBlock Origin uBlock (and I also check the optional "annoyances" blocking in the settings). I could include third-party ads on this site, but I don't. The handful of my videos on YouTube have received over 250,000 views so far, and I could enable the "monetize" feature. Doing that would make viewers watch extra video ads (unless they run an ad-blocker! ), and I'd get some income from it. Of course, I wouldn't have any control over the ads, so they would surely promote products I would never endorse. My only third-party advertising involves occasional and contextually-relevant links to specific products I recommend. I have no idea how much money I'm missing by not accepting ads, but putting ads on my site or my videos would not mean getting paid for my creativity. People like to spin this situation as, "these ads pay for this free service," but it's really just a more intertwined version of having a day-job as a sleazy salesman so you can fund your valuable but unprofitable service or art. Instead of selling out and compromising my values, I'm working to provide a better economic model for creative work via Snowdrift.coop. Against this background, I feel uncomfortable wading into advertising myself. I grew up in Ann Arbor, Michigan, and started working at Oz's Music, a local musical instrument store, in 1998. Over time, some people I met at the store took lessons with me, and those folks referred new students. I ended up teaching full-time without ever doing any real advertising. When I moved to Portland, OR this past August, I found myself needing to start over and recruit new students. Uncomfortably, I looked into how to advertise my teaching. 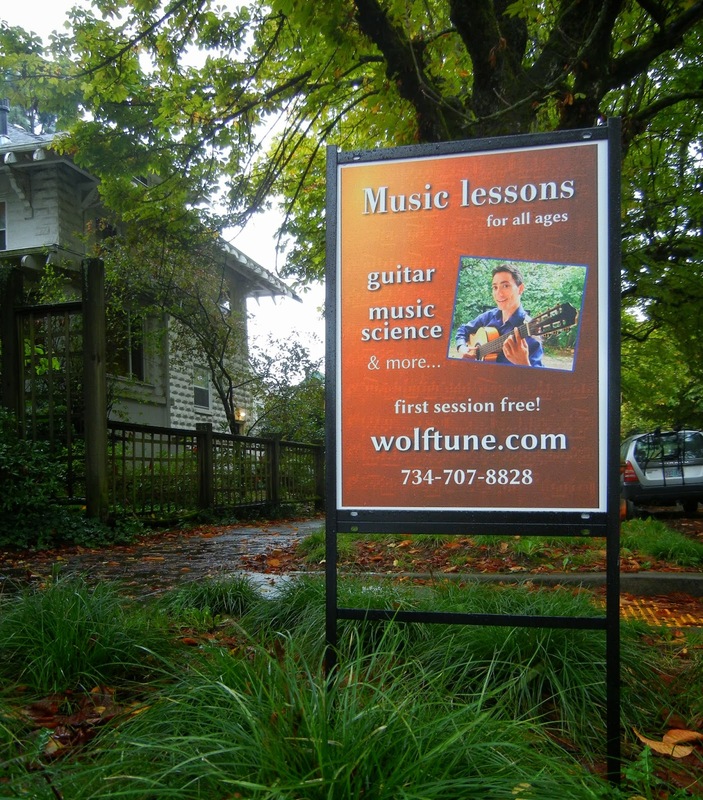 Portland has hundreds of guitar teachers. Why would anyone choose to take lessons with me? Obviously, ads don't have to be obnoxious and manipulative. There's nothing inherently unethical about a simple informative ad. But I'm still wary of wading into the whole world of marketing, and I don't like the pure quantity of advertising already out there. I decided to work on staying as human and transparent as possible and to avoid whatever felt anything like the slick-marketing I see others doing. My first issue: work out how to distinguish my teaching. Most teachers advertise their years of professional performance experience and their educational credentials. Pop/rock teachers generally talk about how awesome guitar is or how they can teach your favorite songs. Classical teachers emphasize their concert reviews and licensed status with formalized trademarked systems like the Suzuki method. Now, I've played full-time in a touring band, have a classical guitar degree, years of experience, and can teach all the generic stuff, but so what…? What makes my teaching unique? Well, I really question things and have developed ways to explain music universally with cross-cultural perspectives and insights from science and psychology. Do other teachers do this? Sure, there are some others, but I've never seen anyone advertise this way or really emphasize these values. Ideally, I'm not just trying to get anyone and everyone to hire me but also to find those students who most appreciate the things I am most excited about teaching. So, I wrote a really long Craigslist post. Many paragraphs. It referenced how self-conscious I feel about advertising. I talked about how guitar is not the most awesome thing in the world, how guitar lessons might not be the readers' top priority, and that's fine. I described how I work to balance my perspectives and question things, and yet I still appreciate all sorts of things about music and guitar, and if you want the sorts of guidance and insights I offer, I'm available. Over time, I edited the post a lot. I removed some excessively critical or self-deprecating bits. It still seems quite unlike the typical slick, concise, lesson ad. And it's brought me some students who expressed appreciation at how refreshing my post felt. As much as I dislike the centralized ad-tracking businesses like Google, Facebook, and others, I decided to get listed where people will actually see the listing (including Yelp and others). I'm certainly not inclined to pay for pushing more ads on people, but I might as well be included when people search. I will never post anything on those systems exclusively. All my postings will be available here on my website, and, if anything, I'll post links on those other proprietary silos. I also contacted past students to get some reviews. I have every reason to think they wrote sincerely, but I feel a bit uncomfortable in the extent of their glowing and enthusiastic reviews calling me the most brilliant and best teacher they've ever had. Of course, I shouldn't complain about that — it's great to feel appreciated. Yet, I also feel conscious of the ways I can keep working to further improve my teaching. I found other listings for music teachers online. One notable site seems to have won a top slot in Google searches: Thumbtack.com. For that reason alone, it was worth investigating. Initially, I had mixed feelings their business model, but it's actually more reasonable than many others. Students post an inquiry. Teachers get notified and choose to pay around $3 to send a "quote" to the prospective student. Only after that goes through can the teacher and student directly communicate. This could seem just a way to get lots of teachers to pay for quotes, but they limit each request to 5 quotes and refund the payment if the quote does not get viewed in 48 hours. I'm still not fully endorsing Thumbtack (after all, they apparently include separate third-party ads on their site — but I don't see them because of AdBlock, of course). However, it has worked for me: I've actually met with 11 students through the system over less than two months, and every one of them decided to go ahead with lessons. Some turnover is inevitable, of course. Some students try lessons but end up too busy, too tight financially, or move away. All in all, I spent many hours setting things up online, writing messages to interested folks, and regularly following up about quotes. I'd save a lot of time if I used generic cookie-cutter ad-copy, but I've chosen to write out things personally more often than not. Perhaps that comes across and is why students have chosen me over other options. I also put up a yard sign outside my home teaching studio. I'm not sure if it's led to anything, but it was a one-time expense. I still feel uncomfortable with putting more ads out into the world, but I tried at least to be as tasteful as I could. I've also done the standard flyering. Like the Craigslist post, I've written out longer stuff that sounds more quirky and human and as unlike corporate advertising as I can muster while staying concise and appealing enough. All in all, it seems my conscientiousness may pay off. I am very sensitive about how my messages treat people. I try to be personable, sincere, and go out of my way to avoid the gimmicky quality of most advertising. And at the rate I'm going, I'll be totally busy and have to start a waiting list in just a few months. But until I get there, I'll keep working to recruit students. This blog post is just one piece of my ongoing efforts to let everyone get behind-the-scenes and relate to me as a real person. I wish everyone would reject all the services and products that advertise at us in more manipulative, disrespectful ways. Perhaps others who read this will feel inspired to be thoughtful and ethical in any marketing they do. Or maybe this post is mainly just my attempt at penitence for my own advertising sins.